CNC’s keyboard. MDI mode also allows for editing or deletingn existing program data. A complete block or complete program may be entered and run in MDI mode. However, once the data are entered and executed, it is not saved in the computer’s memory, as would be the case in the normal programming mode. MDI is also used to set up a workpiece and machine for a production run. MDI can be useful to test a program block or blocks to see whether any alarms occur owing to incorrectly entered program code. The CNC machine tool is equipped with several features that permit safe operation during setup and program prove out. One example is the feed rate override control on the machine control console. The feed rate override permits the programmed feed to be set lower or higher than that called for by the program. Feed rate overrides are generally expressed in terms of a percentage above and below the programmed rates. If, during an initial first article run, a feed rate appears excessive or too low,the feed rate override can compensate until such time as the program may be edited and adjustments made. The rapid traverse feed rate may also be overridden so that rapid positioning is done slowly to verify tool and workpiece location during rapid traverse motions. 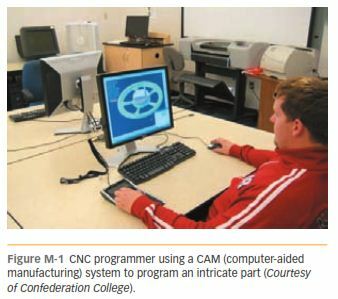 Many CNC machining centers have a feature that inhibits the Z-axis motion but allows other motions to occur normally. 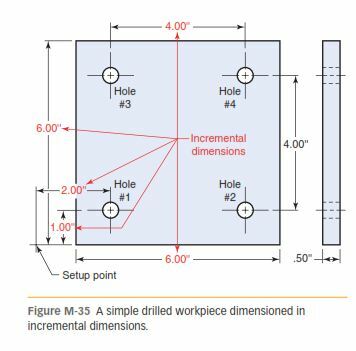 Because the Z axis is primarily the cutting tool axis on machining centers, problems with Z-axis offsets and tool length settings are most likely to occur in this axis. 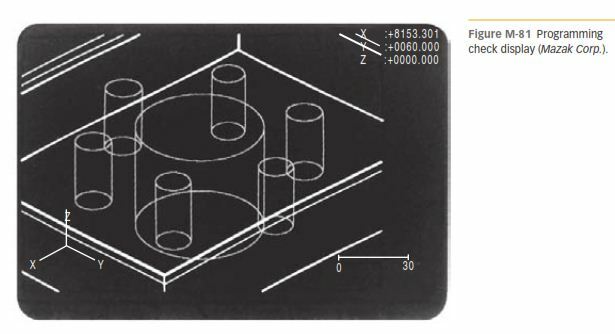 Inhibiting the Z axis allows workpiece positioning in other axes to be verified. Some CNCs can run the entire program with no axis motion at all. This dry run is useful for verifying program code entries. When single block mode is turned on, the program executes one block of code at a time, then waits for cycle start to be pressed again. Single block permits the program to run in slow motion, so to speak, while Z-axis tool offsets and workpiece positions are checked and verified. set by the jog feed rate selector. The machine can be set to advance .0001 in. per press of the jog button. This feature is useful for precise positioning during setup and while using a dial indicator or offset edge finder. If a problem should develop during a machining run, turning on the feed hold feature will cause program execution to pause and hold. The spindle will continue to run, and workpiece or tool position will not be lost. When the feed hold is released, program execution continues normally. Feed hold can be useful in preventing cutter or workpiece damage should a problem develop. Emergency stop will cease all machine functions and should be used only in case of a really serious problem. The program and start position will have to be reset before continuing. tool offsets and rapid traverse positioning moves.